I’ve been meaning to post this for awhile, it’s a project we actually did in February. There’s so many projects I’ve done that I haven’t posted because I am so behind. So I’m resolved to get caught up, starting with this pull-out garbage tutorial. 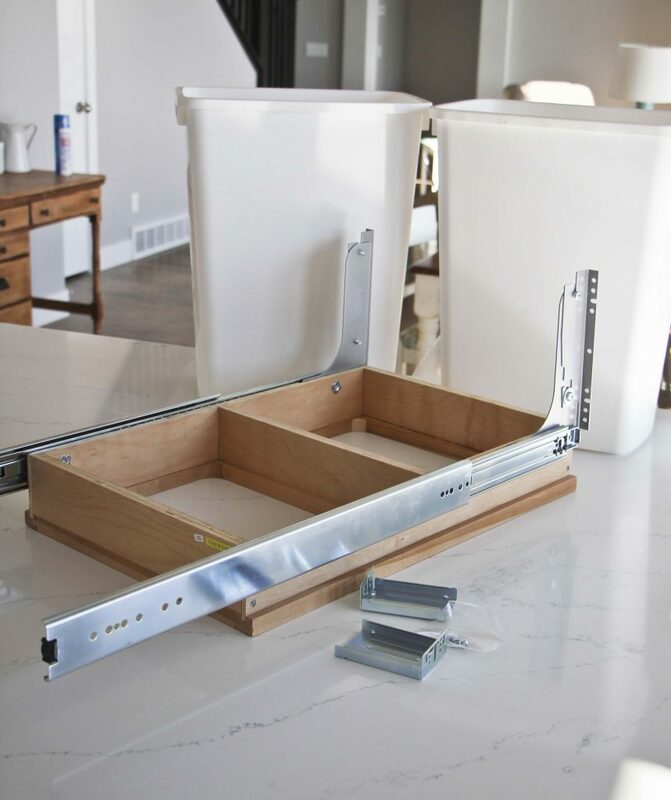 Yes, I’m going to share with you how to install a pull-out garbage. 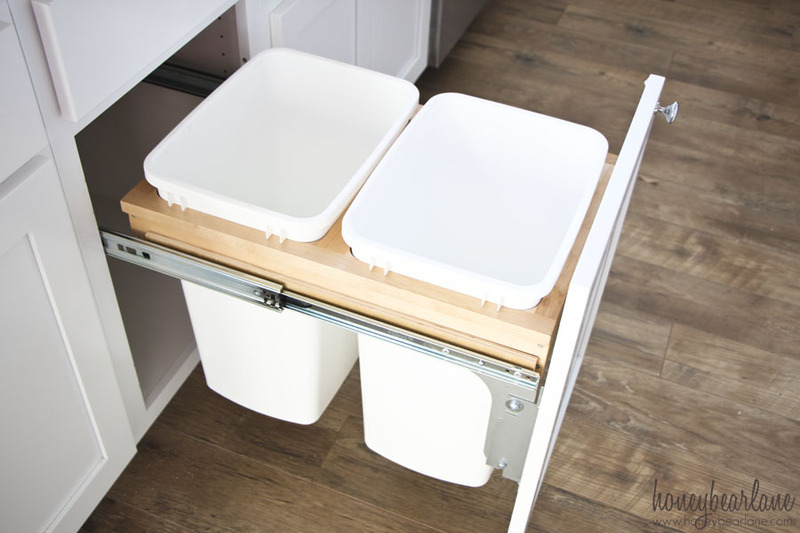 When we were designing our house, I really wanted a pull-out garbage in the kitchen. I’ve always hated how the garbage, a function no kitchen can be without, never had a good place. People put it under the sink (inconvenient and crowded), the pantry (stinky), or just at the end of a cabinet space (ugly.) 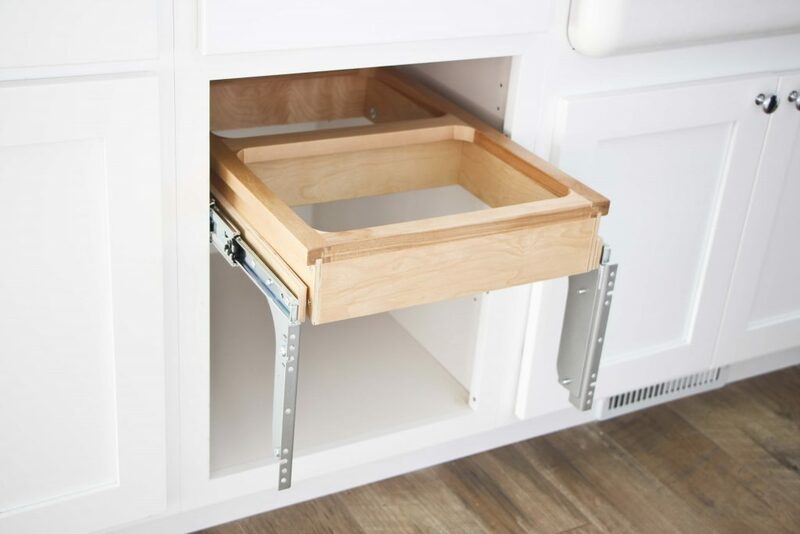 So whoever came up with the idea of turning a cabinet into a pull-out garbage was a genius…at least if you can afford the space which I know not everyone can. However, it was $300 just for that option and we were trying to save money wherever we could, so we decided to DIY that one. We got a kit from build.com, the two-bin option so we could have a place for garbage and a place for recycling. 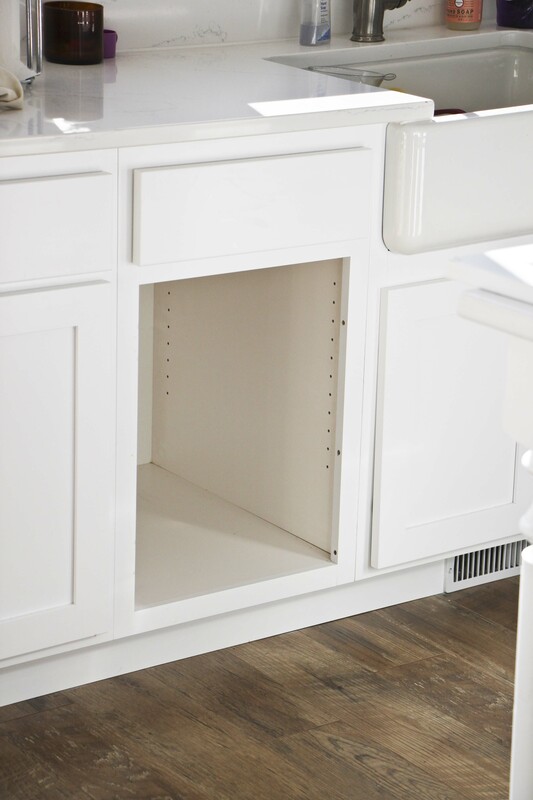 We chose a cabinet to put it in…I wanted it in the island but that wasn’t possible. We had to choose a single door cabinet that was still in a somewhat useful location, and we ended up choosing one right next to the sink. It’s not my favorite spot, but it works. 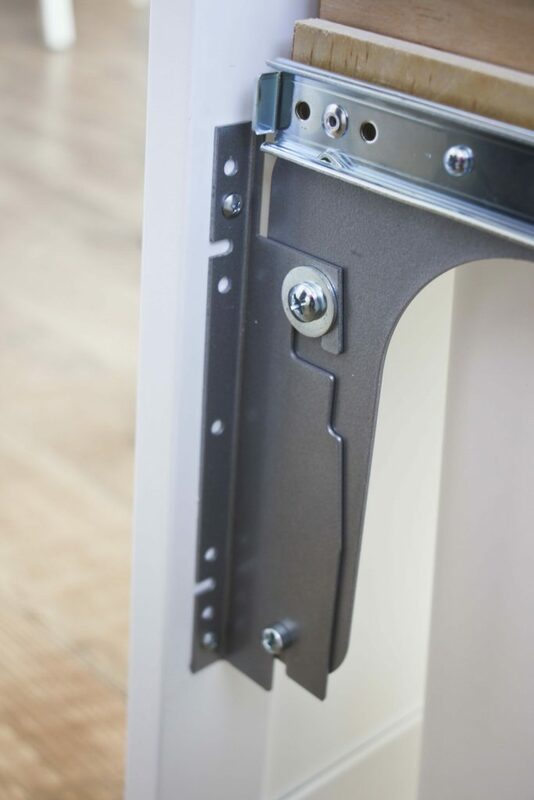 First you take off the door completely and remove the hinge hardware. Then you follow the instructions on the kit and assemble the pull-out trash unit. 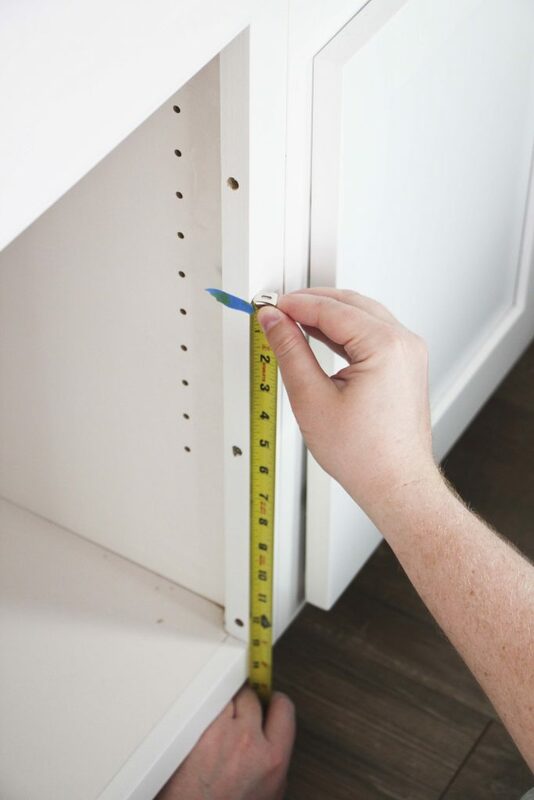 It will tell you where to mark the screw holes on the sides of the cabinets and attached the slides. The kit also contains a back bracket that the slides fit into. 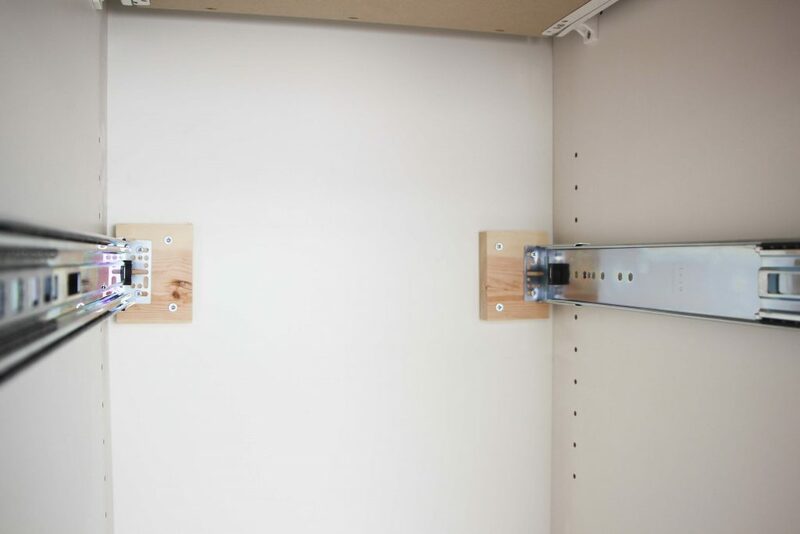 We mounted these onto a small piece of 1/4 block of wood which we screwed into the back of the cabinet. This is where we ran into a large problem. The hardware kit we had was too narrow to reach each side of the cabinet. I’m not sure if this is a problem with the kit or that I made a mistake when I ordered it. But either way it took quite a bit of tinkering to fix it. 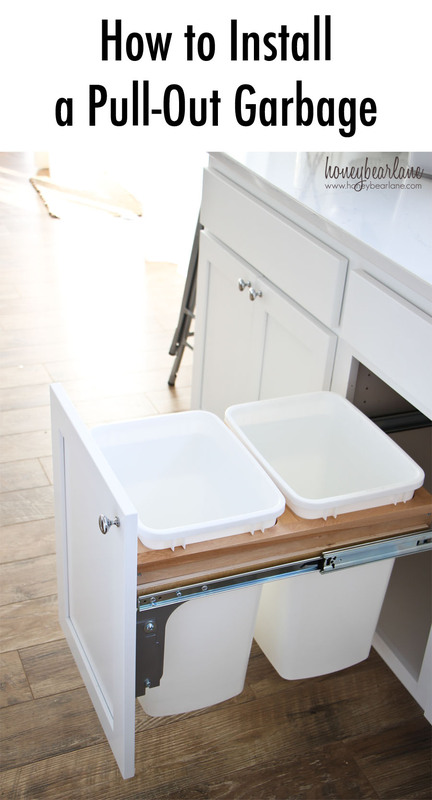 We eventually added a scrap of 1/4″ wood to each side of the unit to give it the extra width it needed to fit. You can see on the sides in between the metal hardware the wood box that holds the bins the piece of wood we had to add. This ended up making it a bit too tight but once we oiled it well with WD-40, it slides fine. 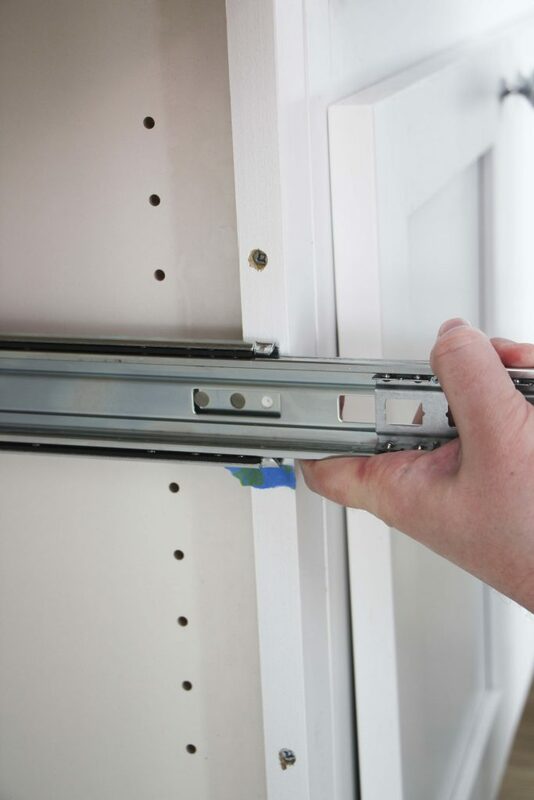 Once you have installed all that, attach the front door in place again with screws. You will need to hold it carefully in place and mark some spots…it was helpful to use masking tape to hold it up. Now you’re done! This project would have gone a lot faster if we hadn’t run into the width problem, that definitely took the most time fixing. But rarely does a project go off without a hitch. Regardless, I am so happy we did this project because it is so nice to have the garbage hidden and away and also to have a nice little place for recycling. This garbage can holds a fair amount as well so I empty it every couple of days. What kind of garbage cans fit in there? We just moved into a house with this exact type of pull-out garbage but I am having such a hard time finding bins that fit.